Recently I attended the Blood Chemistry Analysis course held by Dave O’Brien; Owner of 5th Element Wellness in Fitzroy. 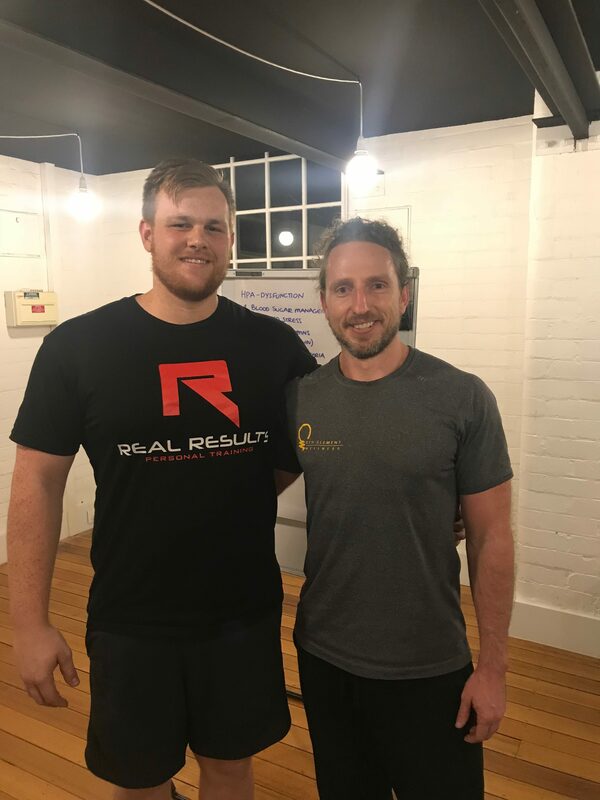 I attended this course with the goal of being able to look deeper than the average trainer and help guide my approach with clients. I have NO intention of looking at blood work in the attempt to diagnose or treat ANYTHING. This is not what I do. The benefit of being able to read bloods is to get an insight into each client’s lifestyle and nutrition history. Issues such as stress, inflammation, poor recovery, poor sleep and poor digestion are things which are incredibly common in our modern day society. All of these things have the ability to slow down or even prevent your ability to drop body fat, build muscle, improve performance and achieve optimal health. THIS is what I aim to do with clients. Dave’s level of information and detail in explaining the relationship of different blood markers and using bloods to improve results was invaluable. Below I have outlined the 10 best things I learnt from attending Dave’s course. While information is important it can often over-complicate a simple problem. Although there is an incredible amount of information and detail that blood chemistry can provide, looking at life through a straw is never the best approach. As personal trainers we need to understand that the level of importance and dedication we put towards training, eating, lifestyle and supplementation can be very different to that of our clients. We need to only provide the most ‘bang for your buck’ advice to our clients as giving complicated programs to the general population often doesn’t lead to better results. Blood chemistry can be another tool of assessing what that ‘bang for your buck’ approach should be. If stress is suspected to be a big problem for someone then bloods can show that. The goal is to then help the client manage their stress through lifestyle changes or different approaches to training, not to help them manage a specific blood marker. The bigger picture is always what we should strive for and bloods Is just another way we can assess that. Conducting assessments on people before helping them is a standard duty of care personal trainers must take. Even despite our best efforts, personal trainers can’t know exactly what is going on internally unless it is assessed. This is where bloods can be a big help. Many people who go to the gym use supplements, at most time with no thought about whether they should or not. Bloods are a great way to answer the question of what NOT to take. If there are signs of potential issues and a particular supplement has shown to make those issues worse then it would be a smart idea not to take that supplement. One of the biggest things I took away from Dave was the importance of the integrity of the gut. A healthy nutrition plan is only half the battle. The other half is our ability to absorb and effectively use the nutrients from the foods we are eating. This is where a lot of people have issues. Bloods can give a great insight into the integrity of one’s gut and whether they are having issues with absorption. This can often help us highlight the main reason why people struggle with things such as stress, lethargy, etc, even when all other measures have been implemented. Malabsorption will also cause a huge impact on dysregulating normal gut flora. SIBO (Small Intestinal Bacterial Overgrowth) can occur when food is not effectively entering our body. This undigested food will sit in the intestines and opportunistic bacteria will begin to feed on this food and re-populate. The feeding bacteria will essentially ferment this undigested food which can lead to things such as bloating, flatulence, lethargy, constipation and/or diarrhoea and a number of other common problems. Being hydrated is extremely important but often not understood. Water alone is only part of the solution. To effectively hydrate ourselves we need a combination of adequate water with a balance of electrolytes. Electrolytes naturally find their way into our drinking water as the water would flow through rocks and collect things such as Magnesium as a result. Our water no longer comes from such a place and with the addition of chemicals and toxins in water, we just don’t receive the same level of electrolytes as we should. Electrolytes are chemicals that help form electrically charged particles (Ions) in the fluids of our body. These ions carry the electrical energy we need for various functions such as muscular contractions, nerve impulses, etc. They are very important and too much or too little of either of them can be a problem. For step 1, a water filter is your best bet. There are many different filters available omg the market with various prices and benefits. The key is to do your research and work within your budget. A cheap filter is better than no filter. For step 2, a high quality electrolyte product is going to be best. The only electrolyte product I use is called Synerplex. It features all of the above electrolytes mentioned and in ratios that promote balance. This is a major factor as Sodium is often over consumed whilst Potassium and Magnesium can often be greatly deficient. When discussing pH or Acidity/Alkalinity, electrolyte balance is vital. After all, acidity/alkalinity in the blood can be determined by blood Chloride/Bicarbonate levels which are both electrolytes. 5) APART FROM MAGNESIUM, NOTHING IS PURELY GOOD OR BAD. This point was the main reason I attended this course. I wanted to really optimise the service I provide to my clients and take the guess work out of the equation. Dave’s approach is very precise with what foods, what supplements and what type of training will work best for an individual. This is something I believe all trainers need to focus on to be able to really claim to be a “personal” trainer. In the health and fitness industry there will always be ‘the next big thing’. One minute fish oil is raved about for its health benefits and then the next it is claimed to cause cancer. If you read through research for particular supplements one things is clear: there is evidence for and against pretty much everything. So how do you know if something is good or not? Easy. You need to understand the body as a whole. Taking fish oil for example can have great anti-inflammatory benefits for people who have issues with raging inflammation. Another person with a suppressed immune system though will respond poorly to Fish Oil as it’s anti-inflammatory properties can further suppress one’s immunity. Or if we look at something like Zinc which has a reported 240+ purposes in the body. If we take Zinc without first knowing what our Zinc to Copper ratio looks like, there can be negative psychological and gastrointestinal effects. Or even something popular like Kombucha or Fibre. These can both have great benefits as well as terrible effects. Someone with SIBO who already has issues with fermentation taking place in their intestines will likely respond very badly to adding in fermented products like Kombucha. Many fibres with pre-biotic properties will help feed ‘bad’ bacteria as well as the ‘good’. If there’s already too many of the bad, feeding them even further isn’t going to help. It’s because things are only really studied or viewed in isolation. Unfortunately, nutrients don’t just work in isolation in the body. They key is to assess whats going on internally first before looking at whether something is good or bad. There’s just no way to tell without a blood test. Without assessing you’re just guessing and eventually you may make the wrong guess and make a problem worse. These 3 systems are extremely important for one simple reason; if these systems don’t work well, we could die. Very low or high blood sugar can cause massive problems and result in death. An inability to react to stress to defend ourselves can result in death. An inability to forms antibodies to protect us internally can result in death. If we are trying to build big biceps or lean out enough to see our abs, what do you think our body thinks is more important? Great abs or stable blood sugar? This means we need to pay attention to the above 3 things. We need to manage our stress, our inflammation and our blood sugar to ensure our body is in a position to build muscle and burn fat. If our body is always focused on stress, inflammation and trying to stabilise blood sugar all the time, seeing results can become extremely difficult. The point is that getting lean or building muscle isn’t that important to our survival. So it often sits at the bottom of the list of things our body actually cares about. To get the most out of your results you need to take care of everything on the top of the list first before focusing on body composition. Some blood markers are reflective of the effects of training. Weights training in particular will cause stress to our nervous system, muscles and connective tissues as well as other effects that can be seen on bloods. Often, a result may come back higher than the norm purely because of attending the gym the day before the test or having a high training load. I have listed below some of the markers that can fluctuate from weights training. If you get a blood test and one of these markers comes back slightly elevated, inform your doctor of your lifestyle habits such as training. This will help them with their interpretation of your results. Eating the same foods repetitively, particularly proteins, can create long term food sensitivities and inflammation issues. It can also lead to nutrient deficiencies if there are nutrients lacking due to a lack of food variety. Most people who go to the gym and aim to eat well tend to live off of chicken, beef, eggs, broccoli and rice. Great foods, but if they are the only foods you eat then you can end up with an issue. We need to broaden our horizons when it comes to food and include foods that aren’t common as part of the normal. Before you vomit at the idea of eating Brains or Liver, understand that you don’t have to eat them all of the time (or ever). The key is to rotate your foods frequently and not to get stuck repetitively eating the same 5 things. Your gut will thank you. This comes back to the point of looking at the bigger picture. Exercise alone will not fix a problem for someone and can make someone’s problem worse. Trainers need to have an understanding of all aspects of the human body and how they are impacting it. This is what myself and the trainers at Real Results emphasise with each client. The goal is not for trainers to try to play doctor and start making wild assumptions about someones health. The goal is to use objective data such as bloods and combine it with thorough knowledge to help clients get the most out of their time at the gym. There are plenty of people who train 6 times per week and count their calories and still don’t get results. There is more to the puzzle and this is where an elite trainer can really help clients find that missing puzzle piece. In a competitive and flooded industry such as personal training, clients expect more of their trainer and trainers should be able to deliver. A trainer may see someone 3 hours per week for an entire year, resulting in over 150 hours of hearing about every bad night’s sleep, stressful day at work, illness and ache and problem that individual has faced. Compare this to the 15-20 mins that a GP has with someone once per year and the impact a personal trainer can have on someone seems very profound. It’s up to us to help make those hours count and be of benefit to a client as much as possible. In the fitness industry, coffee is hailed as king. Whether it’s used as a pre-workout or for an energy kick throughout the day, coffee is usually touted for it’s health benefits and improvements on longevity. Unfortunately, coffee isn’t for everyone. People who struggle with high stress, high inflammation and gastrointestinal issues would do better removing coffee from their day. The issue with coffee is mainly due to caffeine. Caffeine can mimic a thing called Adenosine. Adenosine works by signalling to the brain to slow down. This will have a calming effect and ultimately allows us to feel tired. A great thing if you’re wanting to sleep and avoid stress, anxiety, etc. Caffeine acts like Adenosine by blocking the receptor sites where Adenosine needs to have its effects. This means Adenosine can not signal the brain to slow down and this provides us an ‘energised’ feeling. Once our brain figures out that this is happening, it increases the number of receptors for Adenosine so the caffeine can keep blocking some receptors but we have some other receptors for Adenosine to work. At this point, our normal intake of caffeine no longer gives us an energised feeling so naturally we increase our intake. The cycle continues until we’re left drinking 6,8 or even 10 cups of coffee per day to feel energised. This is not healthy and can have long term implications for trying to build muscle or burn fat. Body fat is broken down by a thing called Epinephrine (AKA Adrenaline). Epinephrine helps tell our fat cells to release the Triglycerides that are stored within them. This is the first step of the fat loss process. Caffeine is a well documented stimulator of Epinephrine so it can work as an effective fat loss agent. The issue is long term production and exposure to Epinephrine from stress and daily caffeine consumption. Our body can eventually begin to ignore the effects of Epinephrine or begin to reduce production all together. This can lead us to being lethargic, unmotivated and also make the fat loss process much more difficult if Epinephrine is not able to have it’s effects. This is where the constant in take of multiple cups of coffee per day can be a problem. A solution to this issue is to either swap coffee for teas or drink de-caffeinated coffee. Tea naturally has lower levels of caffeine and has a list of other health benefits. Green Tea in particular has properties which blocks our ability to store body fat. Decaf coffee can be an ok replacement but the quality of the decaffeination process can come in to question. To recap my experience with Dave O’Brien, the biggest thing I learnt was to look at people’s problems and the solutions as a whole. Nitpicking individual blood markers is not the answer. They are there to provide clarity about the broader problems a person faces that is preventing them from achieving the best possible results. I also gained a greater appreciation into the technicalities that come with supplement use. I gained an incredible amount of information from Dave and look forward to implementing new protocols within Real Results.